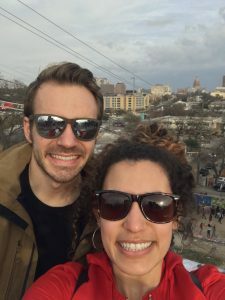 We took advantage of a long weekend back in February to travel to Austin, Texas, a place we had been wanting to visit for quite a while. This was our first time using our Southwest Airlines Companion Pass. 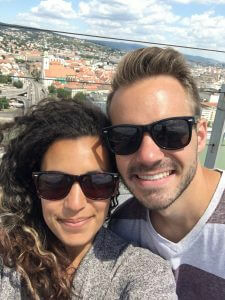 Last year, we signed up for a Southwest credit card and earned enough points to qualify for the Southwest Companion Pass, thanks in large part to their generous signup bonus. In an upcoming post we’ll discuss the Southwest credit card and other ways in which we are able to make travel more affordable and cheaper so we can travel more. Back to Austin. We spent 4 days there and were able to check everything off our “To-Do” list during our stay while not rushing through everything. As per usual, we stayed at an Airbnb in the East Cesar Chavez neighborhood just east of downtown. The place was a private bedroom in a shared house. The owners weren’t there but there was an electronic padlock with a code on the front door and another to our bedroom. There were two other bedrooms with other travelers, but we rarely saw them. The house was just behind a cafe right off E. Cesar Chavez Dr. It was a 10-15 minute walk to Rainey Street and downtown. Plus, the neighborhood itself had a lot to offer. 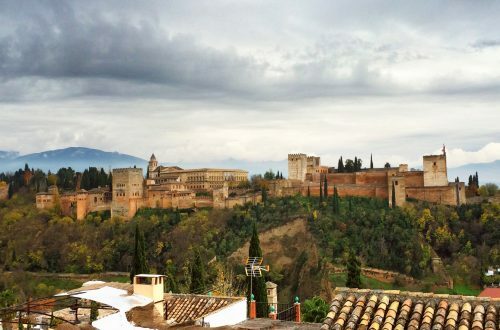 If you’ve never stayed with Airbnb before, we highly recommend it as it’s almost exclusively how we travel. 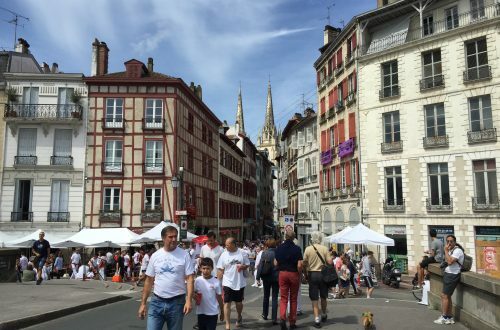 It’s usually cheaper than hotels, more private than hostels, and the hosts often give local tips on things to do and where to eat that you wouldn’t otherwise know. Here’s a link for first time Airbnb users to signup! 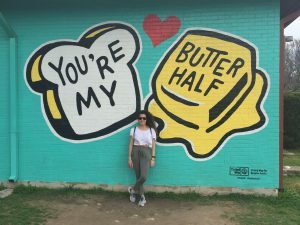 Most of our itinerary in Austin consisted of exploring all the neighborhoods in the Texas capital and eating everything. Rainey Street – Think of a street with a bunch of nice house parties where all of them are different themes: This is Rainey Street in Austin. The street is all houses that have been converted into bars, each with their own unique theme or concept. One was made of big shipping containers and another circus themed with slides and an interior that looked like a big tent. 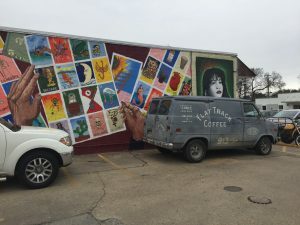 It’s a very unique atmosphere and definitely a place to check out in Austin, especially because we haven’t seen anything like this in other cities. South Congress/South 1st – South Congress Ave. and South 1st St. are two basically parallel streets just south of downtown Austin. You can actually walk right from downtown Austin across the river on either bridge to get there. If you’re visiting Austin from October to March, take the Congress Ave. Bridge as it’s home to about 1.5 million bats, and you can see them flying around about 20 minutes before sunset. Unfortunately, we didn’t see them because we were there in February and they migrate during that time of year. Both South Congress and South 1st are filled with stores, cafes, bars, and restaurants. It was fun exploring up and down the streets as there were a lot of unique stores and restaurants. You could easily spend half a day just checking them all out. 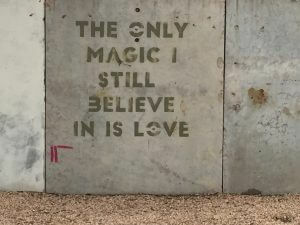 As a bonus, there are also a lot of really cool murals hidden along both S. Congress and S. 1st. Dirty Sixth/6th Street – West 6th Street spans across all of downtown Austin and is best known for its wide array of bars that can get incredibly crazy at night. West 6th St. is sort of divided into two sections. The section of bars further west has more of a post-college/young professional vibe where things can still turn up, whereas the more eastern section, often labeled Dirty Sixth, has the crazier and wilder party scene. Oftentimes they shut down Dirty Sixth Street to cars so people can stumble across the street to the next bar or get to the nearest food truck for their bar time eats. There’s even a chunk of 6th Street that’s east of I-35 (East 6th Street) that’s more mellow but has multiple more chill bars and restaurants. Zilker Park -Zilker Park stretches along the Colorado River just southwest of downtown Austin. It’s a huge park with amazing trails to walk or run and has vast open green spaces where you can relax, picnic, people-watch, or really just do whatever. 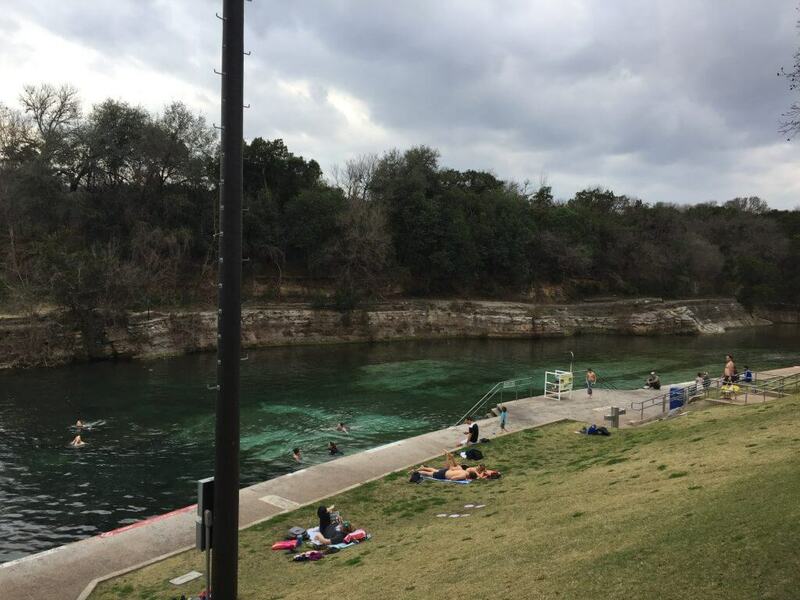 Barton Springs Pool – Barton Springs Pool is a public swimming “pool” located in Zilker Park and is open all year for swimming. The entrance fee fluctuates throughout the year. It was free when we visited in February. We didn’t swim because it wasn’t warm enough to swim for us. There were a few other people swimming though. In fact, the water temperature stays between 68°F and 74°F all year. 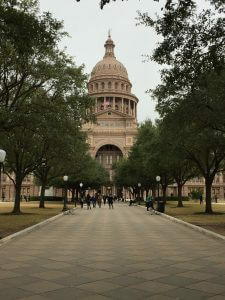 Texas Capitol – Austin is the capital of Texas, so we decided to check out the capitol building. You can get a tour of the Capitol; however, we opted to just go inside and check it out. It was a big, beautiful building that’s worth checking out if you’re there. Beware of the many Confederate statues and memorials. We were both reminded that ‘Oh yeah, we’re still in Texas’ when we saw the memorial to fallen Confederate soldiers. Austin has the feel of other progressive cities like Denver, Portland, and Seattle, but it’s in a very conservative state. These memorials and statues were a reminder of that even though Austin itself feels more forward-thinking. Hope Outdoor Gallery – The Hope Outdoor Gallery is a piece of outdoor, public art that’s open to anyone. It’s a failed condo development that got turned into a community art project. It’s covered in graffiti and street art. Anyone can go in, climb around, and contribute to the artwork. If you want to contribute, make sure you bring a can or two of spray paint! 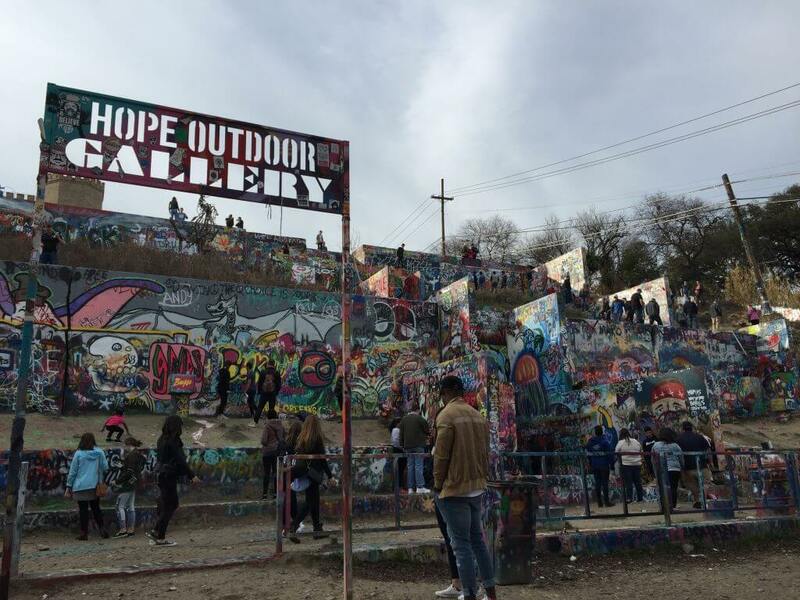 The Hope Outdoor Gallery is going to be relocated in 2018, according to an article in the Austin-American Statesman. Whole Foods – Austin is home to the original Whole Foods. It’s not necessarily a “must-see,” but it’s pretty neat and is absolutely huge! 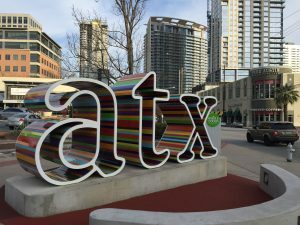 Plus, it’s near the [almost former] Hope Outdoor Gallery and the instagrammable ATX sculpture. 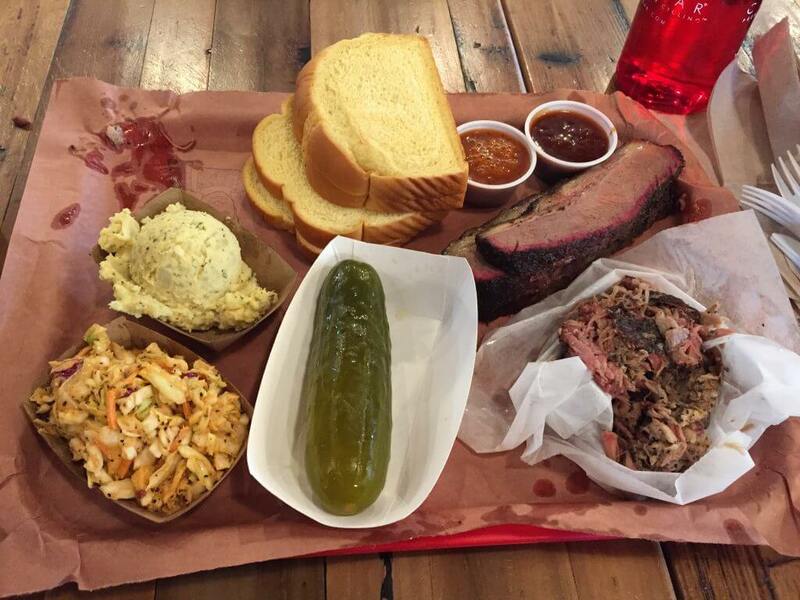 la Barbecue – Austin, as most of Texas, is famous for its barbecue. There are a few different spots you can go. We opted for la Barbecue based on local recommendations and our own research. 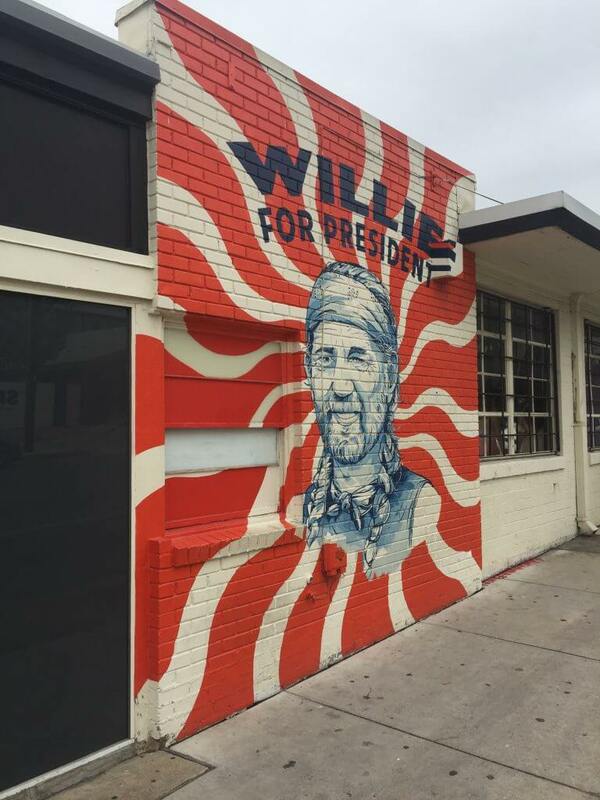 The other probably more famous place is Franklin Barbecue. Supposedly, la Barbecue’s pitmaster used to work at Franklin and then decided to start his own. Whether that’s 100% true or not, la Barbecue was delicious! Make sure you get there early and be prepared to wait in line! We got there a little after they opened and waited about 2 hours to get our food. la Barbecue is combined with a small grocery store so you can get snacks or drinks, including beer on tap, while you wait. Luckily, the Austin Marathon was going on, so we could at least cheer people on at about mile 24 and had something to watch. The wait was well worth it as the food was delicious. We’d happily wait in line again next time we’re in Austin. 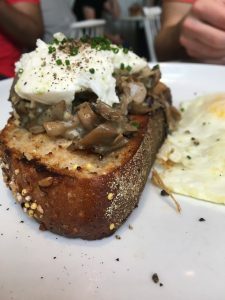 Forthright – A great breakfast or brunch spot in downtown Austin. We got the wild mushroom toast and breakfast tacos with black bean, egg, and avocado to go with our matcha latte and cold brew. Home Slice Pizza – This was a delicious, little pizza-by-the-slice restaurant where we each got a slice of pizza for a quick snack while exploring South Congress Ave.
Churro Co. – For a quick, outstanding dessert, the Churro Co. is where it’s at. 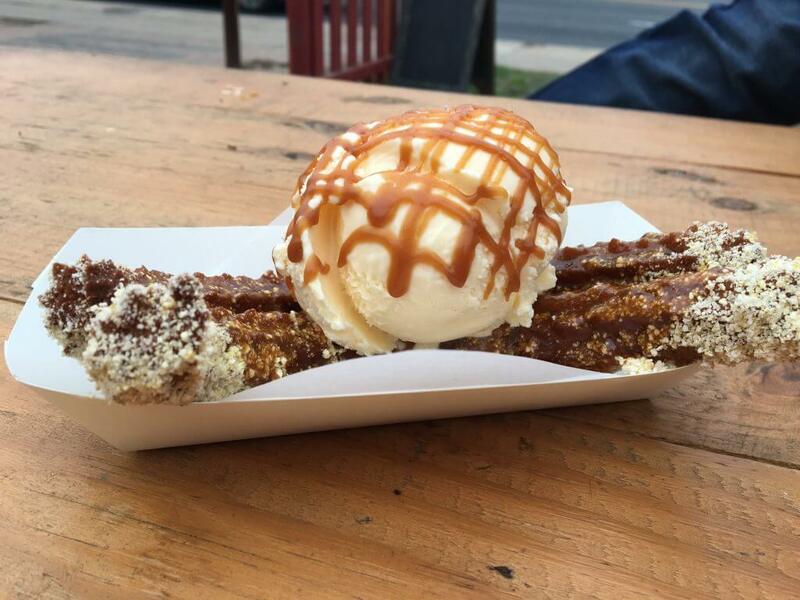 This little food truck offers big taste with delicious churros and churro sundaes. We had the Date Night churro sundae, which consisted of churros tossed in popcorn sugar, topped with vanilla ice cream, caramel drizzle and a dash of sea salt. Four Brothers ATX – The Venezuelan food at Four Brothers ATX was awesome. We loved our vegan arepas. They have 4 locations throughout Austin. 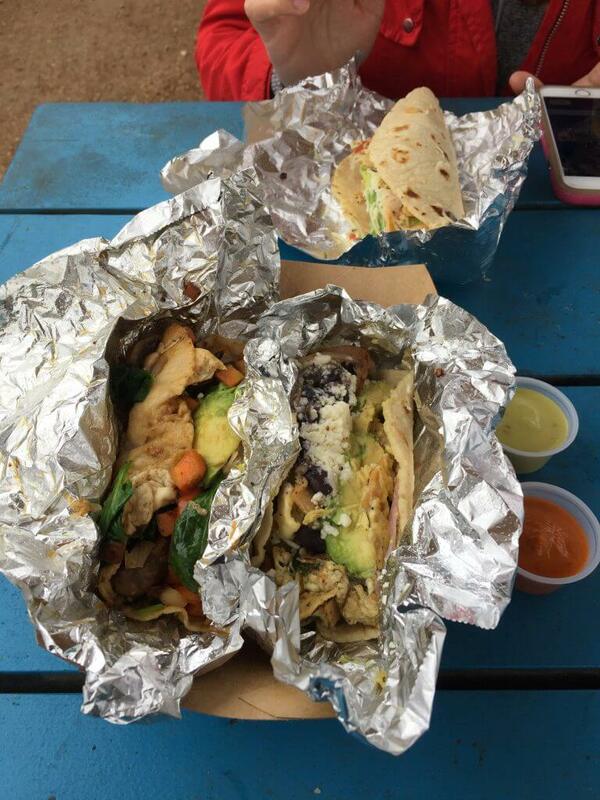 We dined at their food truck on Rainey St. 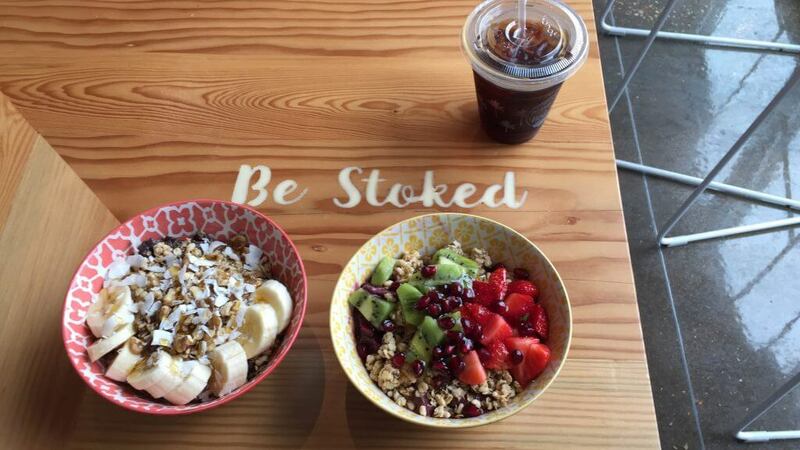 Blenders and Bowls – While it was the only place in Austin we ate açaí bowls, it is dubbed ‘Austin’s favorite açaí cafe,’ according to their website. It was really good and a nice, cool breakfast that could combat the Texas heat. 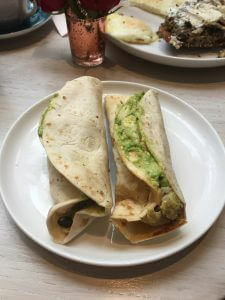 Veracruz Tacos – Veracruz Tacos is one of the most highly rated taco places in Austin, and we couldn’t agree more with the reviews. These were some of the best tacos we’ve ever eaten. It’s just a food truck surrounded by some picnic tables. Be prepared for a short wait in line. Seating will probably be tight, but it’s worth it because the tacos are soooo delicious! We recommend getting the Migas. Easy Tiger – A bakery and beer garden located along a small river near downtown Austin offers a unique atmosphere and great beer. 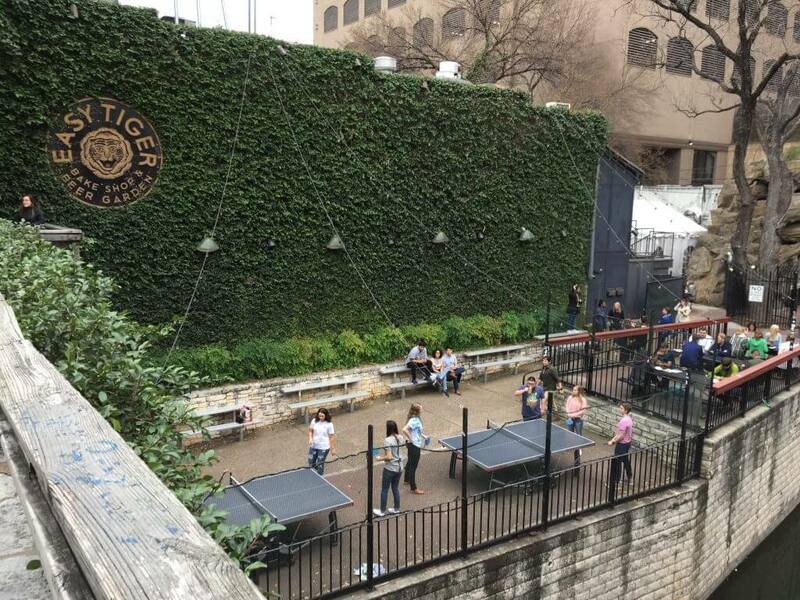 If it was a little warmer out, we really would have enjoyed the outdoor ping pong along the river. Juiceland – Located all throughout Austin, Juiceland offers fresh, affordable, and healthy juices, smoothies, and food. 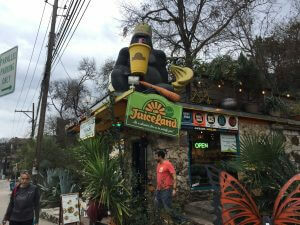 It’s a great place to stop for something healthy while exploring all Austin has to offer. 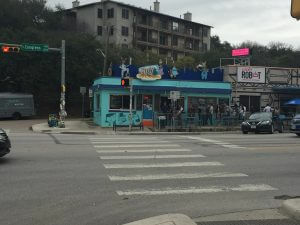 Amy’s Ice Cream – You can never go wrong with ice cream, and Amy’s is probably the most famous Austin spot for ice cream. It’s right on South Congress Ave and is super delicious. We opted for the Mexican vanilla ice cream with Oreo topping. Austin Beer Garden Brewing Company (AGBG) – AGBG, as it’s known, is a bit outside of downtown Austin to the south. It’d be easiest to take a bus or Uber/Lyft there. We decided to walk though. Their beer was really good, but their pizza is really what stood out. The live music was a great touch, and the space (outside and inside) was huge. 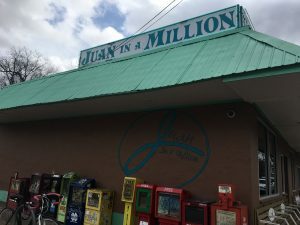 Juan in a Million -Juan in a Million has been around in Austin on East Cesar Chavez for a long time, even before the more recent gentrification of this area. We had a yummy, and incredibly cheap breakfast here. They’re best known for their generous portions, delicious breakfast burritos, and cheap prices. We recommend this restaurant for anyone visiting Austin, especially if you’re on a budget. Austin has a lot to offer, especially if you’re into food trucks and to-die-for barbecue. There’s a lot of live music, and Austin might be best known for SXSW and Austin City Limits music festivals. We’ve heard great reviews of both of these festivals but didn’t visit during them. While obviously those would be an excellent excuse to visit, Austin is an awesome city to visit in and of itself and well worth the trip. 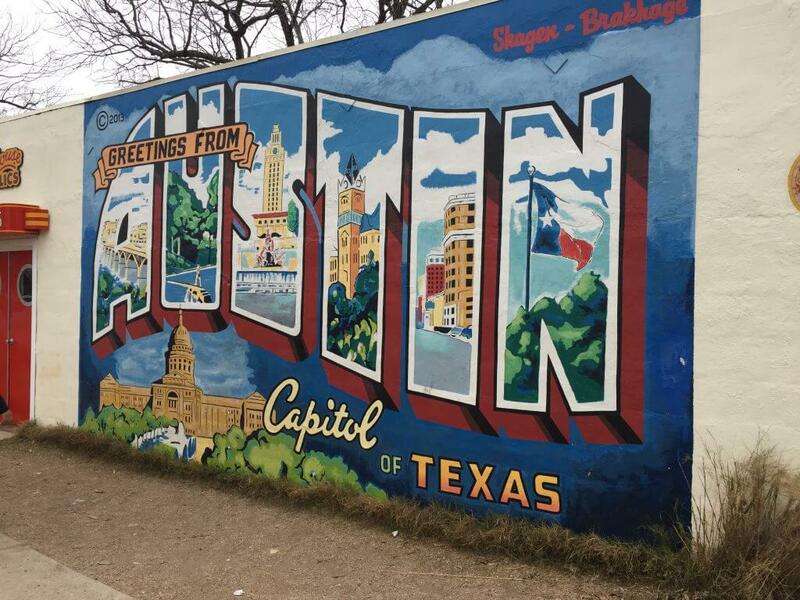 Let us know if you’ve been to Austin and have recommendations for anyone visiting!